Mothers day is almost here! 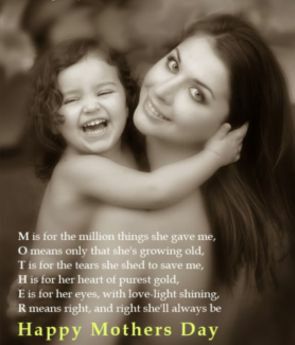 Check out these awesome mothers day quotes. You might even use them to create your own mothers day gift. "A little girl, asked where her home was, replied, 'where mother is.'" "We only have One Mom, One Mommy, One Mother in this World, One life. Don't wait for the Tomorrow's to tell Mom, you love her." "Just when a woman thinks her work is done, she becomes a grandmother." "The mother love is like God's love; he loves us not because we are lovable, but because it is His nature to love, and because we are His children." "A good mother is the greatest blessing ever bestowed on a family of children; and a godless, wicked, worldly mother is the greatest curse that ever blighted a home!" The sweetest sounds to mortals givenAre heard in Mother, Home, and Heaven. Who fed me from her gentle breastAnd hushed me in her arms to rest,And on my cheek sweet kisses prest?My Mother. Who ran to help me when I fell,And would some pretty story tell,Or kiss the place to make it well?My mother. Hundreds of dewdrops to greet the dawn,Hundreds of bees in the purple clover,Hundreds of butterflies on the lawn,But only one mother the wide world over.